Backup Software / Features / Which Edition is Right for You? The Standard edition is great if you need to back up files and folders, e-mails, Windows registry and other regular data. It supports any local and USB drives, LAN (including NAS), FTP and a variety of cloud services (such as Google Drive, OneDrive, Dropbox and WebDAV-driven clouds). If you need to create disk images, store data to FTPS/SFTP servers, or Amazon S3, and create USB recovery drives, consider using the Professional edition. For centralized backup of multiple network computers you need Handy Backup Server Network. The Professional edition has all functions of the Standard edition and also supports disk imaging, saving ODBC-driven databases and using FTPS, SFTP and S3-based clouds as backup storage. It also allows creating bootable USB drives with Disaster Recovery module. If you need to back up Microsoft Exchange Server, MS SQL Server, MySQL, MariaDB, PostgreSQL, Oracle, DB2, Lotus Notes and other databases, please look for the Small Business edition. For saving files and disk images on multiple computers from a central console, the Handy Backup Server Network. 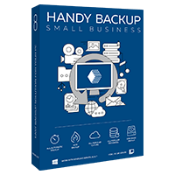 The Small Business edition is an all-included backup and disaster recovery solution for Windows Servers. It allows backing up files, folders, HDD images, Microsoft Exchange, MySQL, MariaDB, PostgreSQL, MS SQL Server, Oracle, DB2, Lotus Notes, Hyper-V and VMware virtual machines and other server data. If you need to back up multiple network servers and workstations from one control console, please consider the Server Network edition, which is a client-server backup solution for networks of different architecture and complexity. Handy Backup Server Network is a client-server backup solution that lets you protect all workstations and servers in a network. It supports backup and recovery of all existing data types including files, folders, HDD images, MySQL, MariaDB, PostgreSQL, MS SQL Server, Exchange Server, Oracle, DB2, Lotus Notes, virtual machines like Hyper-V and VMware Workstation, clouds and other. The architecture of the Server Network edition allows installing Network Agents (client and server versions) onto any quantity of network machines, and controlling all backup activities on these machines from one central management console with an easy-to-use, convenient GUI. You can click a product above to see its features, or check the boxes below to find a solution you need. You can see all products, or select the features you need in the list below. The features you selected are available in all editions. You can click any product to learn about it. How many computers do you want to back up? Documents, Pictures, Libraries, Registry, etc. Where do you want to store data? ** The latest version available is 7.7.9. Download version 7.7.9 here. I have a license for standard version 7. What versions can I upgrade to for free? David, you can upgrade for free to any edition in the Handy Backup 7 product family, i.e. form you version to any 7.*. *, up to 7.9.9. Yes, there is an option of retoring to dissimilar hardware, both for system snapshots and individual files. I've converted from VISTA to W7, but when I reloaded and attempted to register HB 6.0 it said the registration failed. I tried to register via e-mail (as the subsequent pop-up recommended), but I haven't heard back from you yet.В I still have the order number and receipt.В I'm working off the trial version, but need to reactivate my copy. I love your software and have relied on it for a long time. В However, my old machine finally died and I migrated everything to a newer Dell laptop.В What to I need to do to reactivate Handybackup 4.0 on the new machine? В My old license code doesn't work, and I've been without a backup for 3 weeks. At the moment actual release of Handy Backup is 7.3.2 you can download on this site. With more detailed information we did reply to your e-mail. Hi - we need to backup about 10 workstations plus the server that has SQL server with a few databases. I also need central control. With this, I assume I need Your $599 product which comes with 5 workstations. So I have three questions questions: Do I need a SQL plug-in? What is the price for 5 more workstations? Couldn't I use the Small Server product? Thank you for your time. May I shut off some backups/move them, f.e., I don`t need ICQ backup, ACDSee backup, etc., for having more place? Of course you can choose needed plugins. If I need to back up only the Lotus Notes/Domino database, would it be cheaper to buy just this plug-in in addition to the standard/professional edition? Very helpful chart, but why it is so important to back up HDD Image? Does it mean that I donвЂ™t need to install an extra program to make disk image? The HDD image will help you restore your operating system. No, Handy Backup Professional already contains everything needed. Yes, you can take trial for Handy Backup Home Professional.